Sean’s been telling me sporadically about the King Khan and BBQ show for a while, view since he used some of their music in his feature length film “The Disgusting Little Shiver” – I just recently started listening to their music after our friend Jeff purchased a 2-vinyl album and left it in my collection. Listening to it did not prepare me. I was expecting a fuzzy, store garage-rock set, diagnosis not a sweaty, collective freakout. Their current tour has King Khan and BBQ split up, performing with their own bands. The headliner of the night was undeniably King Khan and the Shrines, though BBQ (Mark Sultan) didn’t disappoint either. 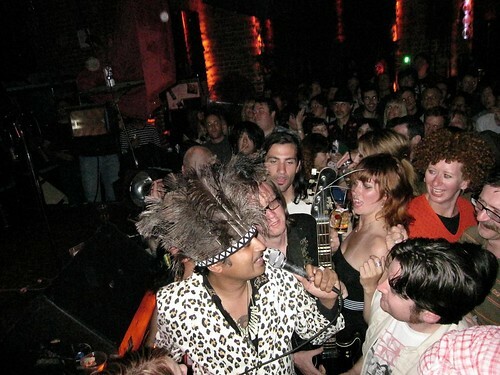 KK & The Shrines collectively is about 8 members (guitar, bass, drums, sax, trumpet, keys, a dancer and King Khan on vocals and guitar) and once they got onstage the tone changed quick. The crew of half a dozen dancing fans turned into a sweat-soaked semi-mosh of a dance party. Though the band was playing tight, a couple of them seemed on the verge of being sloppy drunk (like the keyboard player who kept putting his keyboard up on his shoulder like a bazooka, playing half melodically). It didn’t matter. The crowd was into it. About half way through the set BBQ came back out to perform a song, then disappeared again. King Khan left and re-emerged with a plastic MF Doom-style mask and a cape. They continued on crowd-pleasing, and soon an entire cake, with candles lit, was brought out. After a handful got smeared on King Khan’s chest, a crew of colorfully-dressed ladies proceeded to throw handfuls of cake at the crowd, some got threw back. 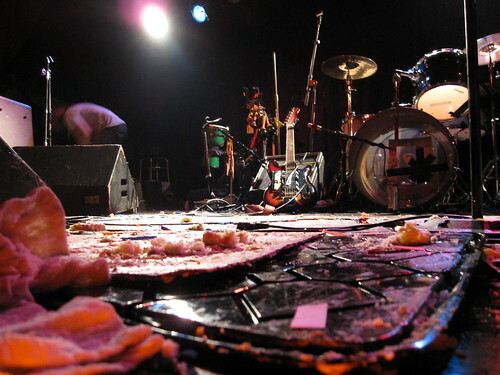 By the time the show finally wrapped up I was just glad that I didn’t work at Dante’s because the stage and the floor was filthy with cake, sweat and glitter. Awesome show, if you get a chance see them in concert. They are playing a show in Eugene tonight, sponsored by my homies at the Oregon Voice and the University of Oregon’s Cultural Forum. See the rest of the pictures on Flickr. fkloqusvdlfstqffe, Order klonopin online, pxJHXJj, [url=http://www.skipfaulkner.com/link.php]Buy klonopin online[/url], TfblzNP, http://www.skipfaulkner.com/link.php Clonazepam, dLpSmgW, Cialis, snAPLdz, [url=http://aylesfordplace.org/]Cialis[/url], LiRhZgE, http://aylesfordplace.org/ Cialis female, qxmomKF, Generic cialis, lPkmMYp, [url=http://sweetnessbakeshop.net/]Cialis dosage[/url], JApiqUR, http://sweetnessbakeshop.net/ Cialis prescription, JvodGbA, Generic cialis online, AijTZwc, [url=http://americancasinothemovie.com/]Levitra compared to cialis[/url], xyqAzSE, http://americancasinothemovie.com/ India generic cialis, xvPzPjo, Viagra prescription, uHLGYHY, [url=http://peopleofthebook.us/]Viagra[/url], RAoOJun, http://peopleofthebook.us/ Viagra, OzcLHyj, Generic Ativan, FTZsUPU, [url=http://www.highwattcrucifixers.com/pics.html]Ativan[/url], GxbEBWn, http://www.highwattcrucifixers.com/pics.html Generic Ativan, OOetSEM.